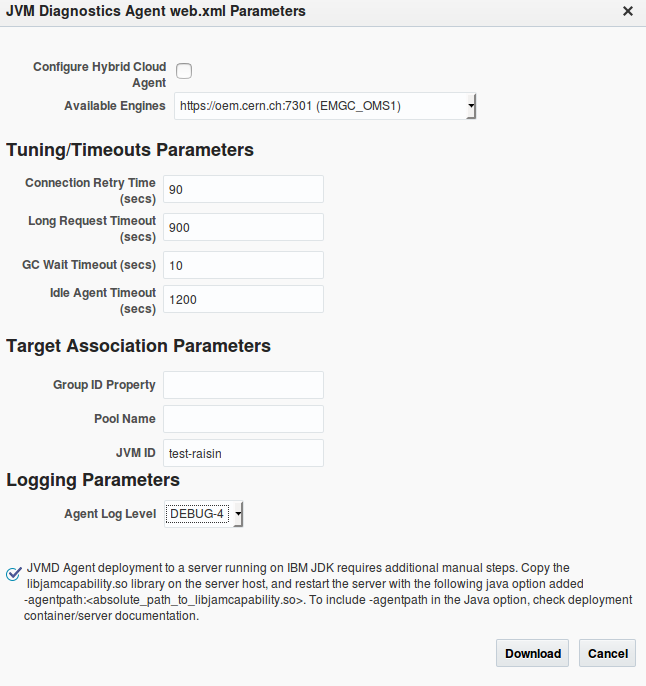 Home » Upgrading my Oracle JVM Diagnostics Agents. I've just realized that the day before we have upgraded our instance of Oracle Enterprise Manager to the latest version, !!! OK, no worries, as you will see upgrading the agents is very fast and simple, however the next time that you here about an OEM upgrade run to your administrators and remind there about your agents! What can not be so easy is to find the right link in the documentation for downloading the agent. I wanted to start from the begining so I went to the oracle help center and search for "jvmd download"
Oups! Only around 4000 results ... Fortunately after a little refine of the search I got the right link. You simply have to go to "setup --> middleware management --> engines and agents". Configure the agent is very simple, at download time OEM offers us a form with some of the configuration settings. Finally the installation process is as simple as deploy the agent in the target that you want to monitor. Just after the deployment the dashboard shows you the different metrics with the collected data. On this introduction I just upgrade one single target, but what happens if you need to do it for your whole data center. No worries, you can do it through the dashboard or if you are more fan of the command line and black screens OEM offers you a script. You can have a look here. To conclude we can say that the upgrade of the agents is very fast and simple. The new dashboards have been polished and they look very clean. In the other hand the user experience could be improved, perhaps all the different menus could be group together in one of the sides of the screen. And, yes you are right, still we have not find out why the application "is slow". For this I am afraid that I have to work a bit more in the configuration and setup of the agent in order to make the "most of it". If we talk about Byte Code Injection I have to admit that other monitoring solutions look superior to OEM in the sense that you can get results faster without the help of any expert administrator.